Since Wolf and Spiral took over in July, 2013, and indeed, even prior to Beltaine of 2013, many improvements and repairs have been made, not the least of which has been the removal of about 18 cubic yards of trash that has been accumulating for years, and the land cleaned of over 95% of it. There's still some trash left to haul out, but the land is looking great. We also moved the old trucks, which were at the top of the road, to the bone yard. Vitor and others helped with many of these projects before they moved on. Before Beltaine of 2013, we built a new temporary bridge across the ravine leading from the Upper Meadow to the Yoni Circle. Everyone was quite pleased to use it and Kindoor had a grin on his face as he was wheeled across it to the other side. Solar guidance lights are arrayed along the path across the dam. The stove and sink inn the upper meadow work once again. A new spring box was built above the pond, which has continued to trickle water and keep the tanks full well in to the drought (as of June '14) However, planting garden items has been cut back to preserve water. 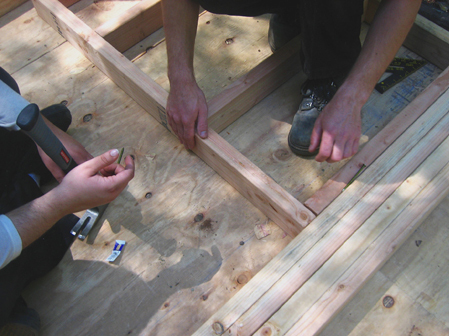 During the spring, before we took over, we made many repairs to the Red House. The old wood stove was removed. It was so cracked that repairs were not able to be done without taking it to a welding shop. That still needs to be done, and any help in getting it repaired would be greatly appreciated, as its one of two of that model in existence. The area where it sat was cleaned and covered with matching tiles that were left by the previous caretakers (Thank you, very much!). In its place, a new propane wall heater was installed, which is quite efficient, using about 5 gallons of propane per month. The sheetrock that was behind the wood stove was repaired. It had softened due to heat from the stove. Fresh paint was added, as well as an electric refrigerator, cabinets in the kitchen, and trim around the windows. It's pretty homey, now. The failing bridge across the ravine going to the Graveyard (Gwydion's resting place) was replaced with a beautiful new one, and stairs cut into the hill. We built a new 12' x 14' cabin half way between the Goat Lodge and the Caretakers' house. It fits nicely into the architectural style of the other main buildings, and is wired to code with lighting and plugs. We constructed a new generator/solar electric shed/center where the old generator box sat. The generator shed now houses an 8,000 watt backup generator and a new 2,200 watt main generator, 2 battery chargers, 8 new deep cycle 12 volt batteries, 6 deep cycle 6 volt batteries and a 5,000 watt modified sine wave inverter. The solar panel structure on the shed is now much higher for better sun exposure. In addition to the 8 existing solar panels, 6 more have been added, with another 8 still to be built. Wolf is buying solar cells with minor defects and used window panes, making the panels for about 25% of the cost of a commercial panel. Trail lighting was installed up the switchback trail to the meadow. Wow, what a difference that made! The trail is much safer at night now, with just about all of it lit up. We ran out of wire and funds, at the last minute, so there's still one or two lights that need to be installed. They run on a timer, plugged into the inverter. A new porch light was added to the Goat Lodge, also on a timer, but soon to be replaced by a motion detector. 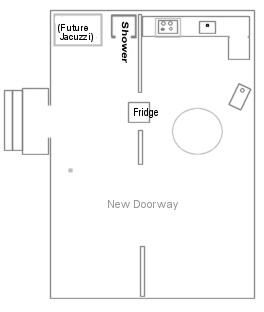 In the Goat Lodge we walled in the shower area, soon to be a finished bathroom, with a vanity and hot and cold running water and sink and mirror � perhaps, even, a flush toilet in the Goat Lodge (especially important to the physically challenged.) The existing septic system is already hooked to the Goat Lodge plumbing, but has had almost no solid matter put into it over the years, so it may not even need a cleaning. This will be checked out, of course. The inside refrigerator wall of the Goat Lodge was opened up, making it more roomy feeling and accessible. The wiring has been upgraded to 110 Volts with new switches and plugs. There is a new wood door on the goat lodge to help keep out the draft. As well as two new windows that had been donated to the land by Gypsy. These new windows replace the old plastic ones that were used to help keep out the chill and do a better job at keeping the front room warm and bright. We have moved the 600 gallon water tank that was sitting in the garden up to where it can now be useful. We now have 3,800 gallons of water. Though this is a great improvement on our way to our 5,000 gallon goal we still have far to go. 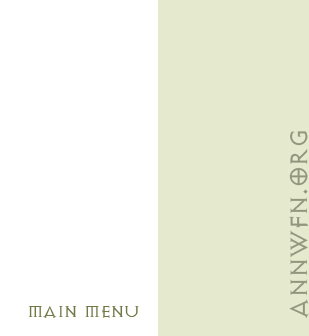 By everyone�s donations we now have more power for Annwfn and are closer to proving that we can be self sufficient and environmentally friendly. Thanks to all of your help and to the FoA. Thanks to Joe, Jeff, Tim, and Jack for rolling our new water tank up old fluffy. Many, many thanks to all those who gave money to help increase our water storage from 1650 to 3200 gallons. We know that we can reach our 5000 gallon goal. Donated by Gyspy and put together by Joe, Jeff, and Juan this nice shed now means that all of our garden supplies can be housed in the same place. It has been beautifully painted by Laura with turtles. This shed is so big that we are going to give the back half to battery storage for the power system. The lovely new dome for the temple has been installed with many thanks to Brita for spearheading the donations. Also thanks for to Miguel and David Raitt and David's company Yurt Co. This is a huge mile stone for us. For the first time the community is the principle donator instead of Jack and Tamar. Go everyone and keep up your help and support. Annwfn is growing more beautiful everyday. Annfwn now has its very own spring. No long dependent on others for its water needs. We send our thanks to the community and special thanks to Gypsy and Jack. We have an additional restroom now on the property. It was built by money donated by Gypsy and by the hard work of many of our members. As with the barrel privy this one has a self composting toilet. We all welcome the new addition to Annwfn. Jack and Louis installed a new flash water heater, and it's wonderful! So, let's hear those ecstatic screams! By relocating and widening the old pass-thru from the front room to the main room Jack, Tamar, Dan, Sherry and anyone else who could help made the kitchen much more usable. Your contributions bought a new cooking stove, with working oven!. Dan and Sherry donated almost-new Formica counters from their old home, complete with cabinets underneath and a beautiful sink and a fancy filter-tap faucet. Arthur rotated the barrel wood stove sideways and made a new handle that doesn't smash your shins in the dark any more. Masochists, we're sorry--but I'm sure you can find adequate pain somewhere else. Arthur and Lewis and Denese are owed many thanks for their diligence in getting a shower installed at Annwfn in the Goat Lodge. This (indoor and heated) shower has been a dream long in coming for the caretakers. Our garden is now expanded to its present day size allowing us to grow many new plants and increase the number of beds. We wish to thank everyone for their hard work and donations. We also invite everyone to come try the plumbs they are many and plentiful. Much thanks to Dawn and Patricia for their donation of a 1650 gallon tank to replace the old 350 gallon tank. We all much appreciate the new increased water capacity. We have raised much money to fix the roofs of all three houses. Thank you to everyone who gave of both their time and money. Much thanks to everyone who helped lay the hundreds and hundreds of feet of piping for our new water system.